Hailed by the Globe and Mail for their “tremendous flair and intensity,” Tiresias Duo was formed by Mark Takeshi McGregor and pianist Rachel Kiyo Iwaasa in 2002. A blind seer from Greek mythology, Tiresias was transformed from man to woman and back again by supernatural means. S/he symbolizes what Iwaasa and McGregor have set out to accomplish: to speak from two very different perspectives with a single voice, to provide fresh insight into conventional chamber music programmes, and to anticipate the future trajectories of the chamber music genre through working with composers and artists from various disciplines. Tiresias Duo has performed extensively throughout Western Canada; they have been featured at the Western Canadian Music Awards (Edmonton, 2008 and Kelowna, 2010), New Works Calgary, Music on Main (Vancouver), Powell Street Festival (Vancouver), the University of Victoria’s Adaskin Series, Redshift Music, Sonic Boom, the Vancouver Queer Arts Festival, and the Banff Centre for the Arts, where they were honoured with a command performance for the Governor General of Canada, Her Excellency the Right Honourable Michaëlle Jean. 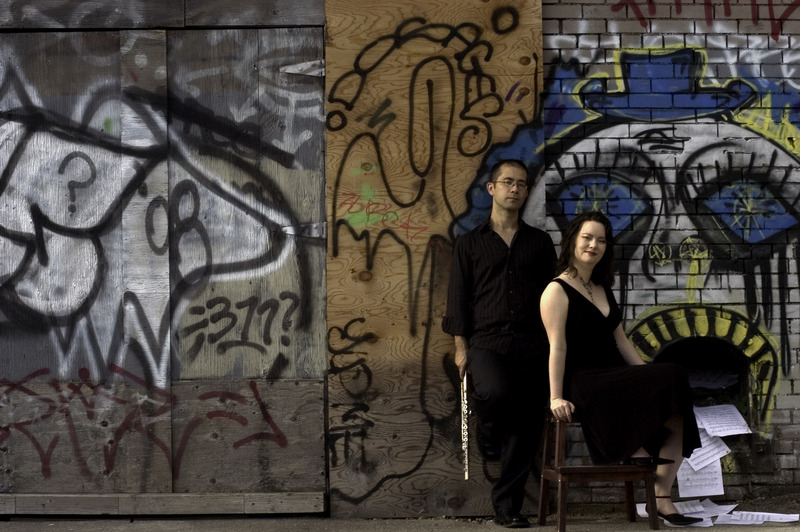 Tiresias Duo has commissioned numerous works by a diverse roster of Canadian composers, including Jennifer Butler, Annette Brosin, Justin Christensen, Brian Harman, Simon Martin, James Beckwith Maxwell, Jared Miller, Jocelyn Morlock, Gregory Lee Newsome, Jeffrey Ryan, and Rodney Sharman. Their first CD, Delicate Fires, was released in 2007 on Redshift Records and includes the commissioned works by Butler, Morlock, and Sharman, as well as music by “first generation” Canadian composers Barbara Pentland and Murray Adaskin. Delicate Fires was nominated for “Outstanding Classical Album” at the 2008 Western Canadian Music Awards. In 2013 Tiresias Duo released their second album, Trade Winds, a double disc set featuring the music of Canadian and Japanese composers, including Toru Takemitsu, Derek Charke, Anthony Genge, Jean Coulthard, Hiroki Tsurumoto, Elliot Weisgarber, Jo Kondo, Kara Gibbs, and Christopher Kovarik. In January 2016 the Duo’s recording of Coulthard’s Lyric Sonatina was broadcast on BBC Radio 3 as part of their “Composer of the Week” series — the first ever to feature a Canadian composer.